The ROBERTS MULTIMEDIA BIRDS OF SOUTHERN AFRICA iOS EDITION is a comprehensive and interactive application that combines multimedia data on 968 Southern African bird species with seven interactive modules for every aspect of mobile birding*. 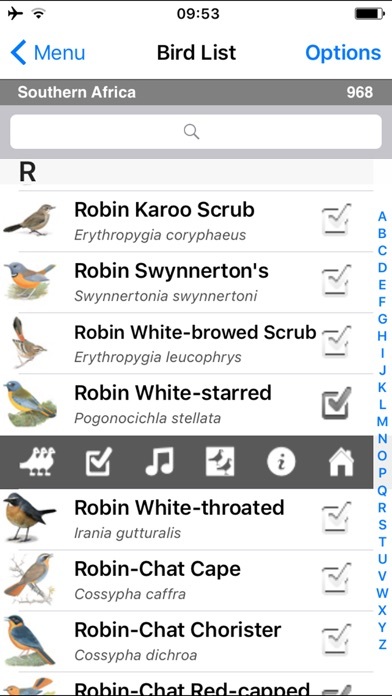 The app can be used as a FIELD GUIDE (like the book), or as a BIRD LIST, with essential functions 'open bird page', play bird sound', 'add to list' and 'view similar birds' available directly in each module. 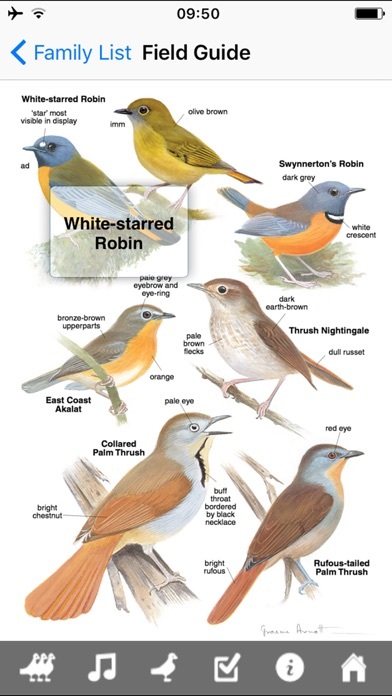 The FIELD GUIDE displays the full field guide pages of the Roberts Bird Guide book for instant comparison and identification. Use the family list or browse the pages for a bird, play the sound, add to your list, and open the BIRD PAGE for further detail. The BIRD GUIDE includes a full bird list and 968 individual BIRD PAGES with illustrations, distribution maps, photos, bird sounds, Roberts Field Guide text and the full Roberts VII text. 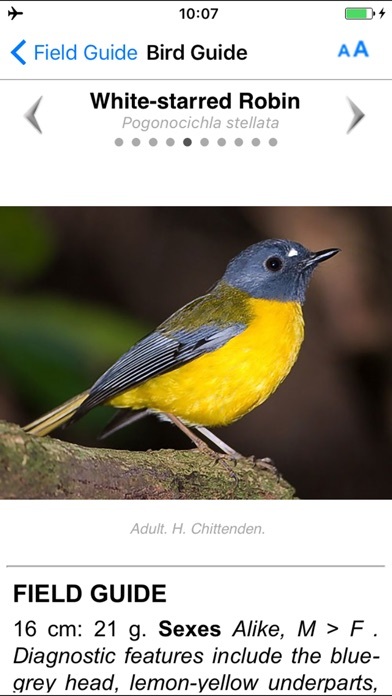 The BIRD LIST includes includes all the new species and new names, with functions for Bird Page, Play Sound, Add to List, Similar Birds and Field Guide Page. You can also select regional lists, and English, Afrikaans, German, French, Portuguese, Dutch and Scientific names. IDENTIFICATION uses your location, habitat, bird shapes and plumage to shortlist possible species for identification. You can also identify bird sounds, nests and eggs. SIMILAR BIRDS loads a list of birds similar to that selected for comparison and identification. COMPARE BIRDS displays the bird pages side by side for direct comparison. MY LOCATION is an interactive map for finding your current location, generating bird lists for your location, and locating birding sites near you. Or drop a pin for a new location with GPS co-ords, pentad and bird list. 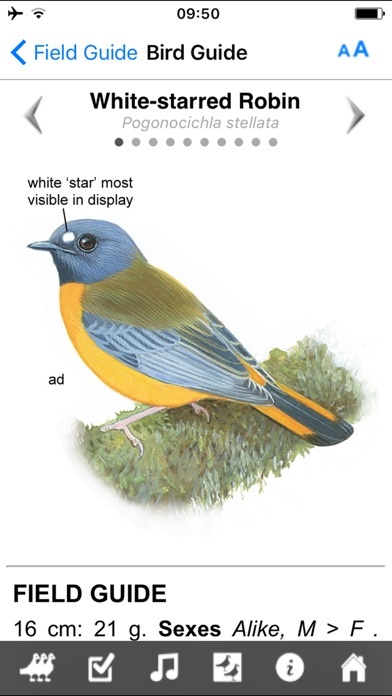 Or open a birding site list and site description. MY LISTS is a personal list manager that includes a life list and sub-lists that report to your life list. You can also sync your lists to iCloud, and export lists to iTunes for backup. Sighting details include place, date, GPS co-ords and pentad, and sighting notes. BIRDING SITES includes details of 280 birding sites around Southern Africa, with text description, photos, bird list, and weather forecast. The MULTIMEDIA DATA includes • 180 field-guide pages • 968 individual bird pages • all the new bird species and names • 1400 illustrations • 5800 photos including 500 nest and 700 egg photos • 920 bird sounds • colour-coded distribution maps with seasonal status bar and endemic and red data species indicated • new rare bird maps. You can take a more detailed tour on our website at www.sabirding.co.za. * This app can be used in the bush and remote locations. It does not require a wifi, phone or internet connection to operate. # DIFFICULTY PURCHASING? If you have difficulty purchasing with your credit card, you can purchase iTunes gift cards from major stores. ## This app cannot be transferred to Android or Windows devices. After updating to latest version that used a whole gig the app no longer works as before. The feature that allows you to get a larger picture when you rotate your phone no longer works on the 11.0.3 platform. Honestly not even sure why such a large update was required??!! Can’t see any extra features or reason why it needed so much space! As a novice I have found this app to be as good as the book regarding the text. And much better due to the photographs, sounds and gps integration. It is also better than the other birding app for Southern Africa. The information in the guide is good and it is great to have when "in the bush". However it is in desperate need of an update. The handling of lists is awful. The app crashes often. Requiring a second purchase of the app for iPhone is a fat cheek! If I was considering a purchase I would wait for the next version when all the bugs have been fixed. Developer, please, an update that fixes the crashing and poor list handling would earn this app 5 stars, and would then warrant the price tag. You have put a lot of work into this, now polish it up so that you can earn some payback fairly. I know that the app is new. 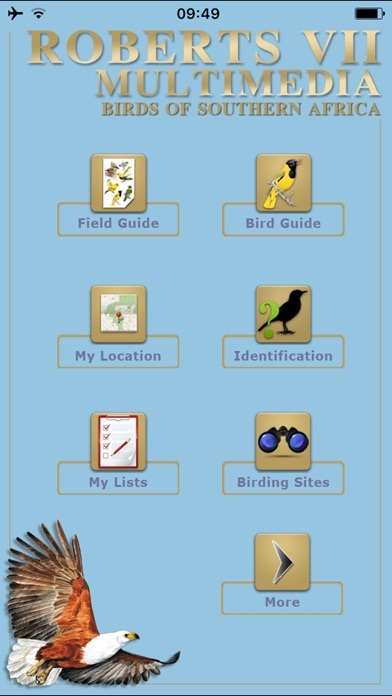 I got the app because I thought that you can add your bird sighting on the map with a pin that you can see all the bird sighting on the map like they have for the Bird sighting places with all the green pins that would be a nice thing to have that your List of the birds that you have seen work with the Locations that you have put on your My List. The other thing is that I would like to put the app as well on my iPhone But I don't want to pay the price again, that the iPhone and the iPad app work together with each other that your list and locations sync with one another, because sometimes you don't have your iPad with you and people like me have my phone on me at all time and i don't have iPad with my it will be nice to have it on the iPhone but I don't want to pay that price again. the other thing is I would like the app to turn Horizontal as well, like the Sasol eBirds app that I could put on my iPhone and my iPad. But please don't get me wrong the app is nice it has a lot of information, and the actual photos of the birds which help. Just sort the things out then it will be a Great app. I often do lectures for students out in the field and this app is going to make things so much easier. Have used my PDA for years but this is going to be so much better. Really happy I got it - so worth it.